1982 Ronald D. Sisson Jr. The foremost responsibility of an Eagle Scout is to live with honor. To an Eagle Scout, honor is the foundation of all character. He knows that “A Scout is trustworthy” is the very first point of the Scout Law for a good reason. 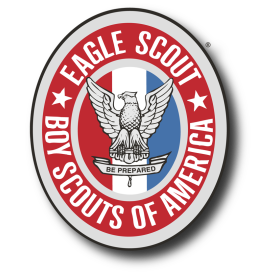 An Eagle Scout lives honorably, not only because honor is important to him but because of the vital significance of the example he sets for other Scouts. Living honorably reflects credit on his home, his church, his troop, and his community. May the white of the Eagle badge remind you to always live with honor. The third obligation of an Eagle Scout is to be courageous. Courage has always been a quality by which men measure themselves and others. To a Scout, bravery means not only the courage to face physical danger, but the determination to stand up for the right. Trusting in God, with faith in his fellowman, he looks forward to each day, seeking his share of the world’s work to do. Let the red of the Eagle badge remind you always of courage. The final responsibility of an Eagle Scout is service. The Eagle Scout extends a helping hand to those who still toil up Scouting’s trail, just as others helped him in his climb to the Eagle. The performance of the daily Good Turn takes on a new meaning when he enters a more adult life of continuing service to others. The Eagle stands as protector of the weak and helpless. He aids and comforts the unfortunate and the oppressed. He upholds the rights of others while defending his own. He will always “Be Prepared” to put forth his best. I affirm my allegiance to the three promises of the Scout Oath. I thoughtfully recognize and take upon myself the obligations and responsibilities of an Eagle Scout. On my honor, I will do my best to make my training an example and my status and my influence count strongly for better Scouting and for better citizenship in my Troop, in my community, and in my contacts with other people. The Boy Scouts of the world constitute one of the most wholesome and significant movements in history, and you have been counted worthy of this highest rank in it’s membership. All who know you rejoice in your achievement. Your position, as you well know, is one of honor and responsibility. Your are a marked man. As an Eagle Scout, you have assumed a solemn obligation to do your duty to God, to Country, to your fellow Scouts, and to mankind in general. This is a great undertaking. As you live up to your obligations, you bring honor to yourself and to your brother Scouts. If you fail, you bring down the good name of all true and worthy Scouts. Your responsibility goes beyond your fellow Scouts — to your Country and your God. America has many good things to give you and your children after you; but these good things depend on the qualities she instills in her citizens. You are prepared to help America in all that she needs most. She has a great past, and you are here to make her future greater. I charge you to undertake your citizenship with a solemn dedication Be a leader, but lead only toward the best. Lift up every task you do and every office you hold to the high level of service to God and your fellow men — to finest living. We have too many who use their strength and their intellect to exploit others for selfish gains. I charge you to be among those who dedicate their skills and ability to the common good. Build America on the solid foundations of clean living, honest work, unselfish citizenship, and reverence for God. Whatever others may do, you will leave behind you a record of which every Scout may be proud.